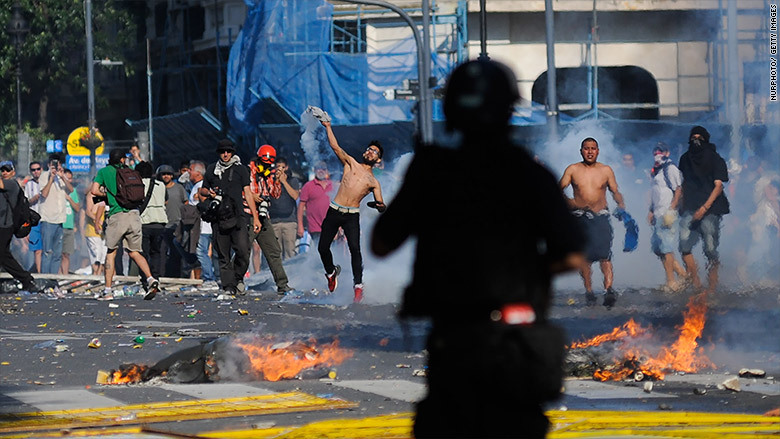 A major pension reform became law in Argentina early Tuesday morning after violent protests rocked the nation's capital, Buenos Aires, on Monday. Rioters threw rocks and Molotov cocktails while police fought back with rubber bullets and tear gas Monday afternoon. More than 160 were injured, including 88 police officers and 74 protesters, according to state-run news agency Telam. Lawmakers had spent more than 12 hours debating the economic reform that will reduce pension payments to individuals. The new law revises the size of the payment four times a year instead of twice a year, the way it did under the old system. The new formula also bases payments mostly on inflation, which is falling. The previous law calculated payments based on wages and social security contributions. The 127-118 vote narrowly passed shortly after 5 a.m. ET on Tuesday. Lawmakers had been debating in Congress all night. It's a big victory for President Mauricio Macri, whose pro-business administration pushed the reform through Congress after a resounding mid-term election in October for Macri's party called Cambiemos or "Let's Change." Critics argue it will hurt retirees, who paid into the system for much of their working lives, by reducing their income. Macri's administration says the reform will save the government roughly 60 billion pesos ($3.4 billion) next year. The aim of the reform ultimately is to reduce Argentina's large fiscal deficit.